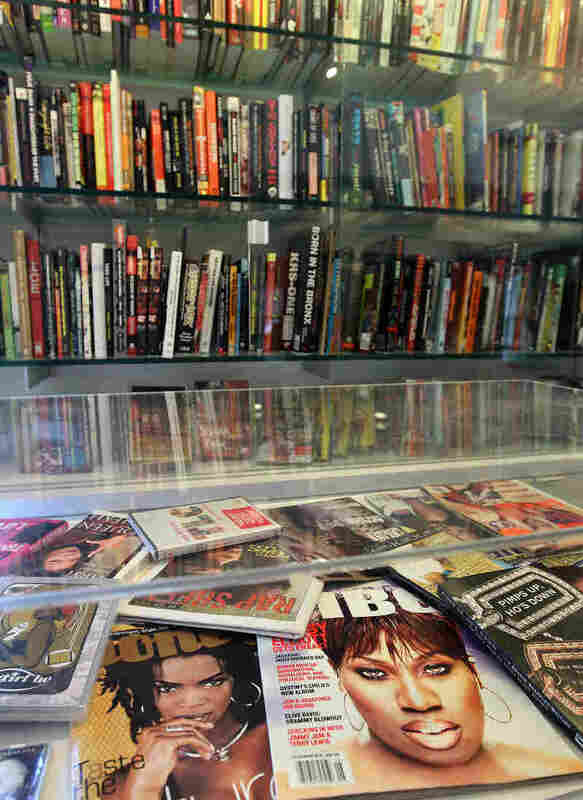 Keepers Of The Underground: The Hiphop Archive At Harvard "In order to be well versed in the culture, you have to be an encyclopedia," 9th Wonder says. "What The HipHop Archive is doing is creating a family tree." 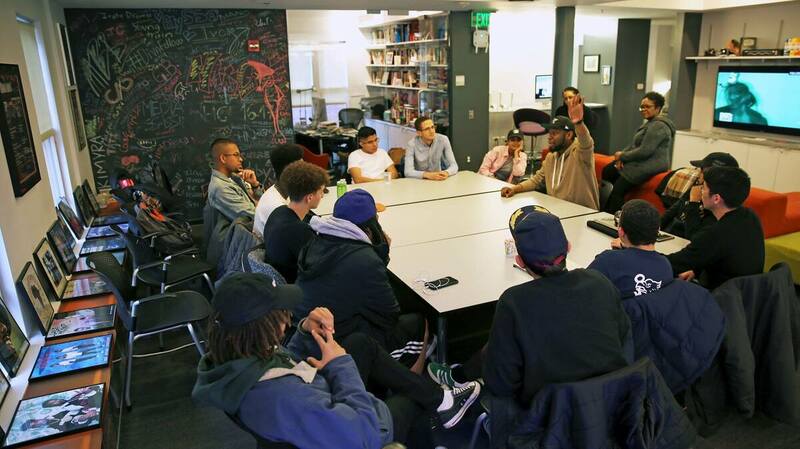 Producer 9th Wonder speaks with student staff members at The HipHop Archive & Research Institute in Jan. 2018. This story is the first in NPR's new Morning Edition series produced by The Kitchen Sisters (Davia Nelson & Nikki Silva) called The Keepers, stories of activist, archivists, rogue librarians, curators, collectors and historians — keepers of the culture and the cultures and collections they keep. 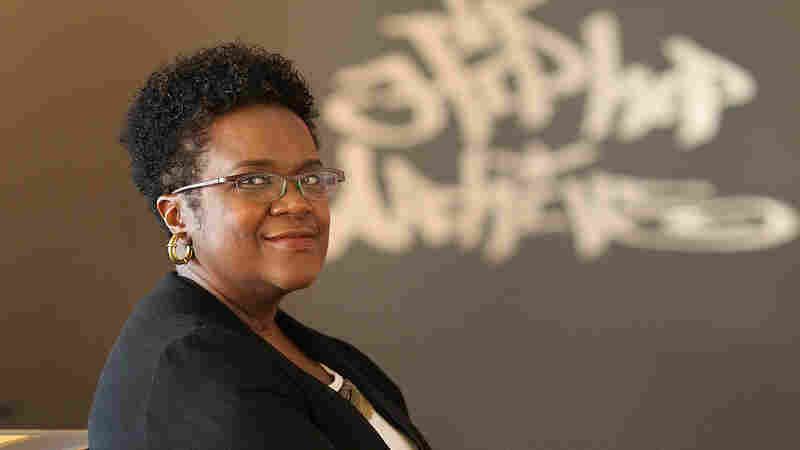 Over a decade ago, students of Dr. Marcyliena Morgan, then a Professor of Linguistics at UCLA, started dropping by her office, imploring her to listen to hip-hop. "I taught urban speech communities," Professor Morgan says. "Students said, 'We want to do work on hip-hop.' I said, 'That's performance but it's not a speech community.' They said, 'We'll be back.'" They wanted her to hear the rapping and rhyming, the bravado of the wordplay, this new underground culture that was being created. They wanted her to help them begin to archive the medium. Professor Marcyliena Morgan teaches class in The Hiphop Archive and Research Institute, at Harvard University. "They came back with the most amazing projects," she says. "They showed the elements of hip-hop: rapping, MCing, the writing of lyrics, the poetry and rhyming, b-boy, b-girl dance, graffiti art. And what it meant to their lives." Marcyliena Morgan sought the advice of scholar, cultural critic and instituion-builder, Professor Henry Louis Gates, Jr., Director of The Hutchins Center for African and African American Research at Harvard University. "I remember when Marcy shared her idea with me and I thought, "Oh my god,' Professor Gates recalls. "I'm no fan of hip-hop, but you don't have to be Albert Einstein to realize that this was a brilliant idea. Imagine if someone had thought of this when jazz was at its zenith. 'Why don't we have the jazz archive at Harvard?' Of course it would have been turned down but, in retrospect, they would have been a genius." Morgan was not an archivist by training and she didn't listen to hip-hop. But she listened to her students. Bit by bit, she opened her office, drew on available resources and began to collect the history and material culture of hip-hop. Then, in 2002, The Archive was packed up and moved from Professor Morgan's office at UCLA, across the country to Harvard where, with the strong support of Professor Gates, it became The Hiphop Archive & Research Institute at the Hutchins Center for African and African American Research (at the time, known as the W.E.B. DuBois Institute) at Harvard University. Along with gathering everything about hip-hop for preservation, The Archive works with rappers and producers to share the history and thinking of the masters of the medium and pass on the traditions. The Archive employs Harvard students and works with interns to help maintain the memorabilia and do deep research into hip-hop culture. "My earliest hip-hop memory would be at my mom's house in the crib," says Robert Rush, an intern at The Archive. "She used to play Montell Jordan's "This is How You Do It," The Notorious B.I.G. Those were the sounds that soothed me. They were lullabies that spoke to the experience that I was having." In 2013, The Archive created The Nasir Jones Hiphop Fellowship for scholarly research in the field and The Classic Crates Archive of 200 seminal hip-hop albums curated by super producer 9th Wonder. "Every art form has their standards that they've placed in the canon. Mathematics, science. Everybody has their greats and somebody placed them there," 9th Wonder says. "People in the visual art world say 'OK, this is what's going in The Louvre. This is it. We decided this.' I think hip-hop needs the same thing." The first four albums highlighted in Classic Crates were The Low End Theory by A Tribe Called Quest, The Miseducation of Lauryn Hill by Lauryn Hill, Illmatic by Nas and To Pimp A Butterfly by Kendrick Lamar. "In order to be well versed in the culture, you have to be an encyclopedia because what The HipHop Archive is doing is creating a family tree," 9th Wonder says. Click the audio link to hear the full Morning Edition story and enjoy a Spotify playlist of essential hip-hop songs curated by The Kitchen Sisters.